Before I proceed, let me give you an update on the rattlesnake count for this season (spotted and killed): 37. YES, 37! Wow. On the one hand, I wouldn’t want to run across one unaware but on the other hand, maybe I can see one but be somewhere safe inside? Like with glass between me and the Rattler? Just kidding. I don’t think I want see a rattler up close. 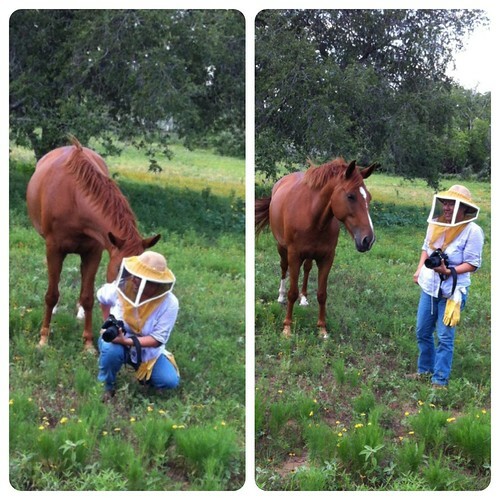 The horse is one of two very inquisitive residents at the original Gonzales bee yard. It snuck up on me while I was snapping pictures. I get so engrossed in getting a shot that I sometimes don’t realize how long I’d been in a spot. That’s how the bees usually got me in the past. Me in front of hive too long. It’s how I discovered I was allergic to stings. Oh well! Live and learn. Ahh! Mark’s home and we have to split for the Spurs/Thunder Game 2 in SA so I must tell you quickly that we spent pretty much all day Saturday looking at three properties where we can live AND expand GBR. That makes five properties total and we wish there was a way to combine this bit from house one with that bit from house two and the price from house three. We’ll keep working at it but it sure is nice to have a good realtor working with you on things. Thank you, Carol! 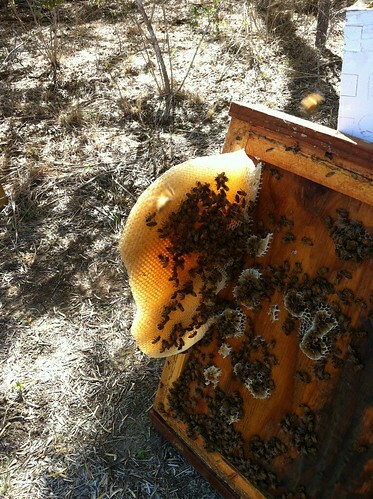 I caught these bees on their “first flight” out of one of our strongest hives at Deadman Creek. 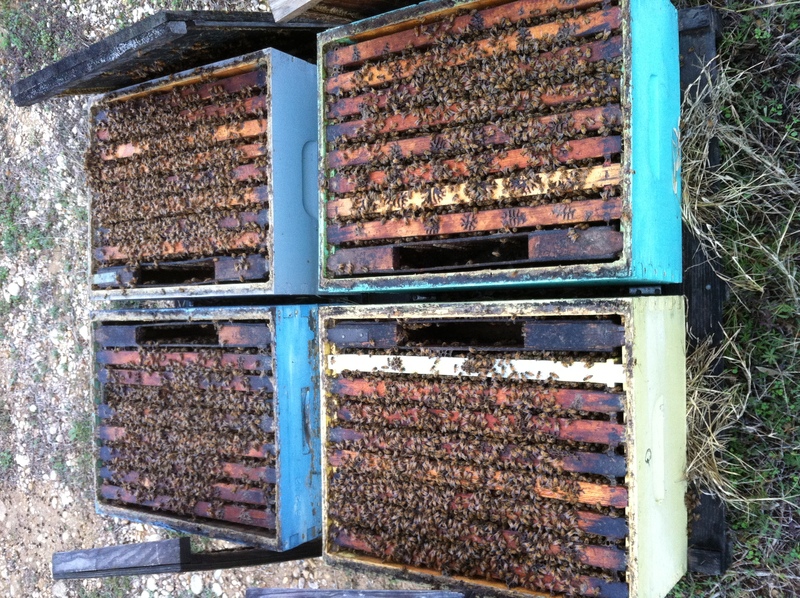 This hive remained consistently strong through the drought and now through the winter, albeit a warmer than usual winter so far. All hives continue to collect pollen (the first real protein they’ve had since July) and they are all finally starting to grow a bit. 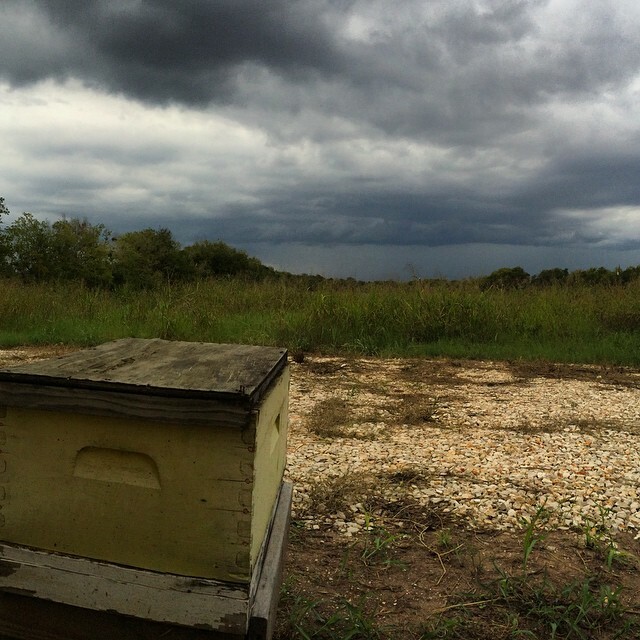 The rain and the state of the hives makes me optimistic for our bees and their honey production this spring. The queen from this hive came from Wilbanks Apiary in Georgia and it is one of only three Wilbanks queens that I have. I’m certainly thinking about buying more Wilbanks queens when it comes time to re-queen this year. 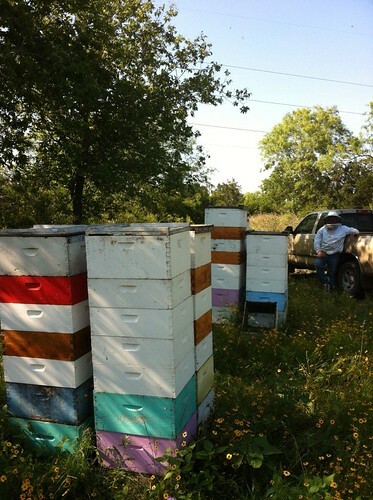 It’s early December and the 50 new hives that David and I brought in from Jasper are looking terrific. 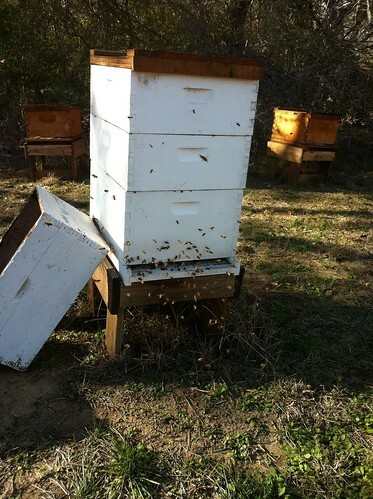 You can see about seven frames of bees in each of these four hives. They were a little light on honey stores so we made sure that they had a feeding of sugar syrup before the next cold snap hits. Most were fed two days ago, and when we checked them today, all of the feeders were dry. We’ll give them one more feeding in December, and that should get them through the winter. 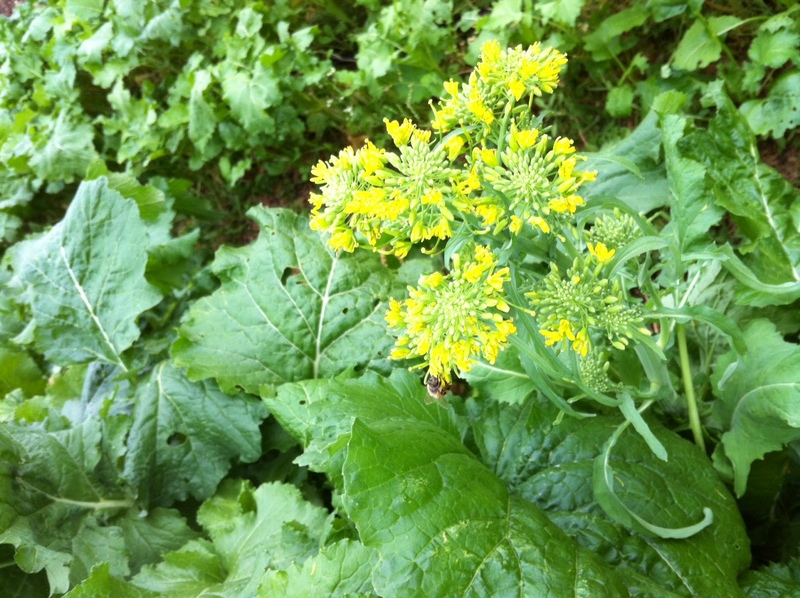 Our good fall rains should help the wild mustard bloom over the winter, and that will help the bees also, on days that are warm enough for them to forage. It looks like our organic farmer at this location is also letting some of his winter crops go to flower – he is always looking for ways to help the bees, to thank them for all the pollinating they did for his squash and melons this summer. We appreciate it, Pedro! It has been a busy week. 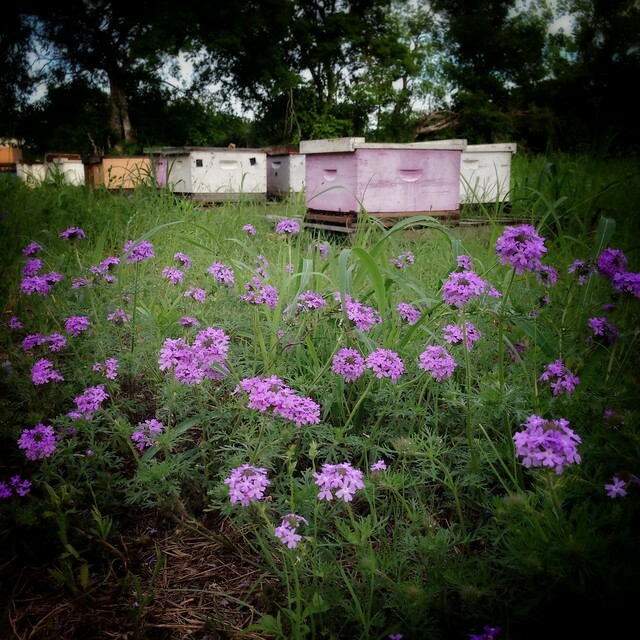 We finalized the purchase of a few hundred pounds of blueberry honey from a beekeeper in Massachusetts, and 900 pounds of beeswax from a beekeeper I met 30 years ago who lives outside of Devine, Texas. His name is David Park and I didn’t know that I knew him until I pulled into his place today and recognized the huge oak tree growing just outside his honey house. 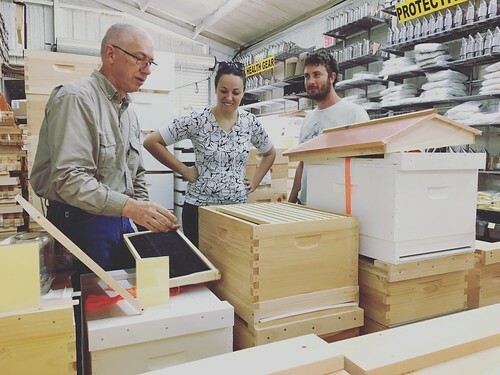 Around 1980, about the time I developed a passion for beekeeping, I found his name in the American Bee Journal and called to ask him if I could tag along as he worked his hives. 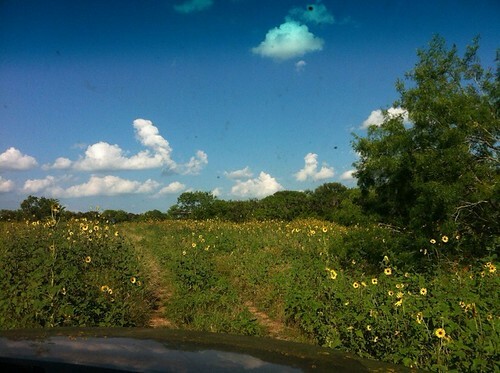 He graciously agreed and on a warm day in February I got my first taste of commercial beekeeping as we worked in his bee yards scattered between San Antonio and the Mexican border. I don’t remember all the work we did, but I do remember that it was hard, hot work, even in February, and that I was very tired at the end of the day. After all these years I had forgotten his name, but I still remembered that old oak tree. Today we traded stories, shared a few trade secrets related to beeswax processing and sampled some of his fresh pecans. His son, also named David, and also a commercial beekeeper, dropped by and it was nice to visit with him too. I admire what both of these men have accomplished with their bees over the years. 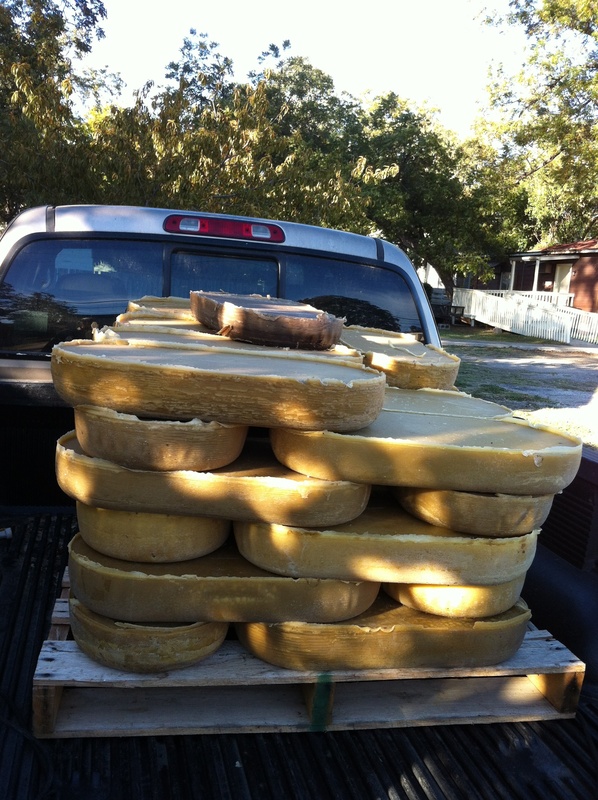 I left there with 900 more pounds of beautiful golden-yellow beeswax and without a single photo (even though reminded by Thien) until I got home. The first batch is in the wax melter right now and early tomorrow morning I will run it through the micron filter and see how it looks. Can’t wait! 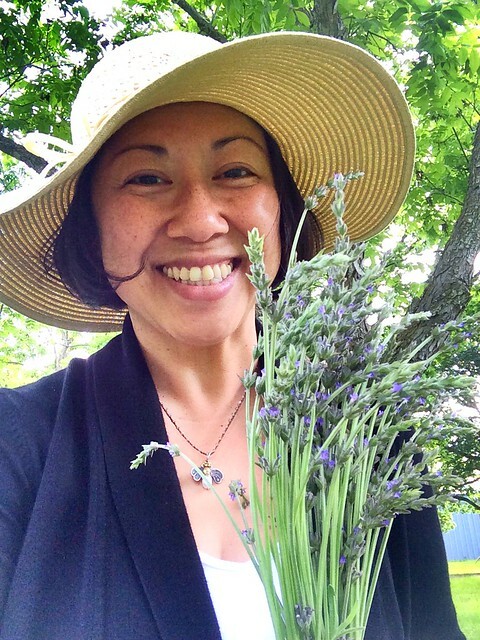 Then it’s off to teach beekeeping class while Thien holds down the fort at the Elks Lodge craft show. Come by and see us if you can! I finally made it back to check the nucleus hives at Deadman Creek, and I was thrilled to find robust hives enjoying a good pollen and nectar flow, all thanks to the generous rain we had earlier this month. The bee brush was in widespread bloom and the air was filled with its sweet fragrance that reminded me of the smell of the honeysuckle nectar that my brother and I would “harvest” and drink when we were very small children in Houston. Not sure my mother ever knew about that. You can see evidence of the honey flow in the new, white combs on the lid of this hive, and on the frame of fresh honeycomb, partially filled with honey, that the bees built in place of the hive feeder that I forgot to put in a few weeks back. Nothing quite like eating fresh honey filled honeycomb right out of the hive on a beautiful fall afternoon. Evidence of the pollen flow is in this frame that is filled wall-to-wall with bees and brood. I know from this year’s drought that bees, no matter what and how much you feed them, will not produce abundant brood and plentiful new bees without a steady flow of pollen into the hive. 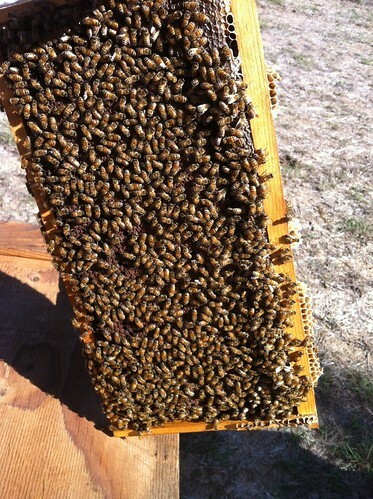 I know that a hive with a new queen and frames that look like this will have no problem making through the winter. But just to be sure, I am going to do one more round of mite treatments while our weather is still mild.